A beautiful one. The peacock is India's national bird. 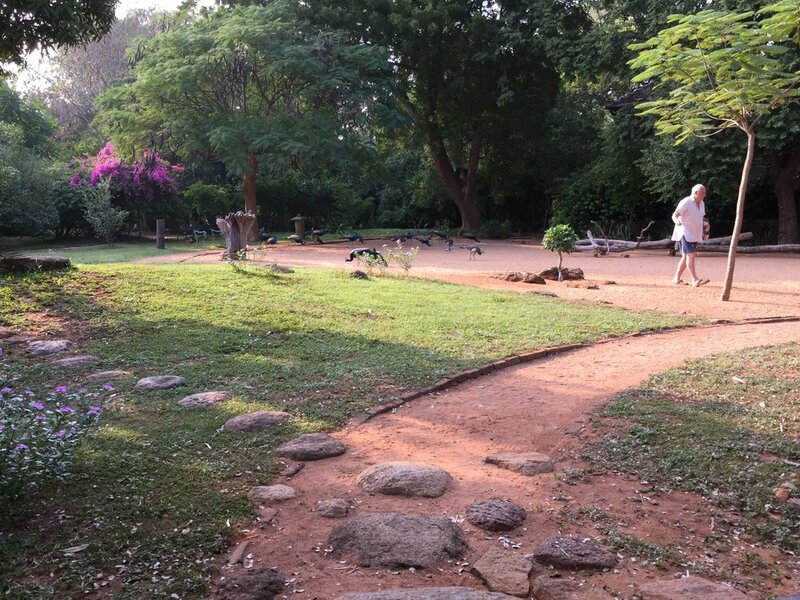 This lovely lovely place is where we have spent our last week in Auroville: it is called Gratitude Farm. Our host is Thomas, a true Auroville oldtimer from Germany, and a lover of birds. We have peacocks, geese, guineafowl and other feathered friends around us all day - and night. And we get raw milk and raw butter from his dairy herd - what a treat! Highlights of the day are feeding times when Thomas walks around the grounds and sprinkles corn and grains onto the sand. Here is the yard with one pigeon and one peacock. And here is Thomas at feeding time... see how many peacocks you can find! Here are two of the friendly geese.